Tattoo’s have really grown in popularity over the past decade, 40% of young adults have a tattoo and many women are now getting very large tattoo’s. Tattoo’s can be a real work of art and when done correctly can be very attractive. As a matter of fact 36% of people with tattoo’s say they are addicted to the ink and have multiple tattoo’s on their body and plan to get more. Let’s face it, what you thought was really cool when you were single and 25 may not be so cool now that you are 35 and a parent. Many people regret tattoo’s they have, surveys indicate that 20% of people with tattoo’s have a tattoo or multiple tattoo’s they would like removed. At Aesthetic Laser Center we offer the latest in tattoo removal utilizing the latest in laser technology for tattoo removal. Prior to advancements in laser tattoo removal individuals that wanted to remove a tattoo had to go through skin damaging treatments like acid removal, excision, or dermabrasion. No longer do you have to suffer through the painful and time consuming treatments of the past, at Aesthetic Laser Center we offer the latest in laser tattoo removal. 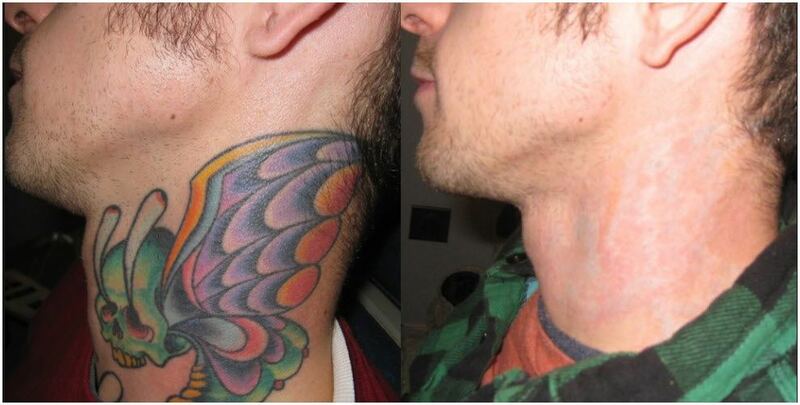 *Most of our clients report that getting the tattoo hurt more than having it removed. We will provide you with a numbing cream prior to treatment to make it as pain-free as possible. *The average tattoo takes approximately 5 treatments, but can take as many as 15 treatments depending on color, ink, skin color, location and age of tattoo. During your initial consultation we will be able to give you a better answer once we see the tattoo and other factors to consider.